Many churches have active worship committees or planning teams, and an abundance of books and resources guide pastors and laity. Encounters with the Holy offers a conversational model of worship planning that was developed to train practitioners to be more reflective in their planning of worship experiences. The model planning, ordering, worshiping, reflecting is a flexible, fluid pattern. It provides a more circular, spiraling practice of imaginative planning, preparing the leaders and the space, and reflecting theologically to understand more fully the experience of worship. It has been tested in congregations, seminaries, and campus ministries amid a wide range of denominational and cultural styles. An underlying theological assumption of this approach is that we are engaged in holy work when we plan and prepare for worship. Leaders study, preparation, and training are themselves an encounter with the Holy. Therefore, we are called to become more informed and better prepared liturgical leaders. The language and encouraging style of the book is accessible to student pastors, pastors, and lay people interested in learning to think more deeply about worship. 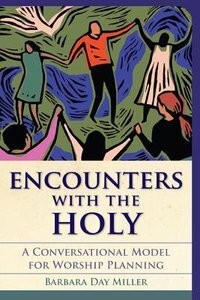 About "Encounters With the Holy"
BARBARA MILLER has worked with educators in professional development and teacher education for more than fifteen years. She is currently Managing Project Director of the Center for Professional Communities in Education at Education Development Center, Inc.